La Petite Fashionista: Make Your Spirits Bright! Even though I'm working non-stop, and my university feels like a ghost town. I've been doing all I can to keep it feeling like the holidays; christmas movies, girls nights out & lots of hot chocolate. I've been slowly investing in cold weather clothes, like this is a new navy peacoat I scored at a local boutique! 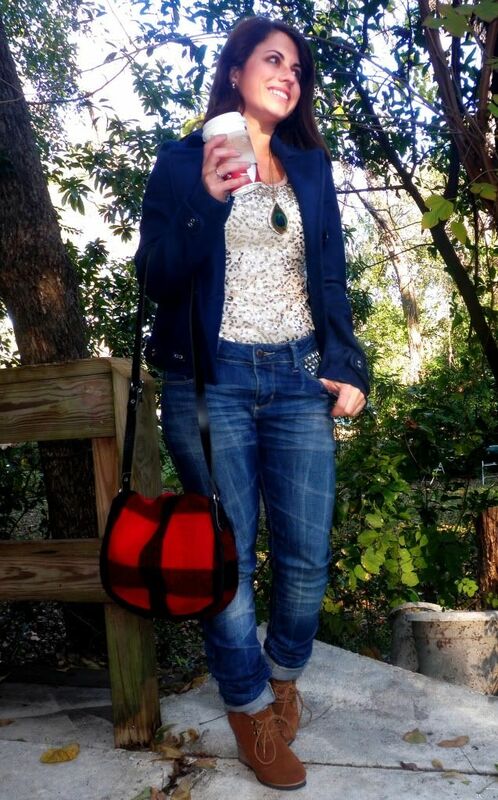 I'm also loving my Steve Madden suede wedges & buffalo plaid Duluth Pack bag & how they toned down my sequined shirt w/ their cute, outdoorsy vibe! It's supposed to be getting down to the 'teens tomorrow. I'm so excited to start preparing myself for chilly weather! 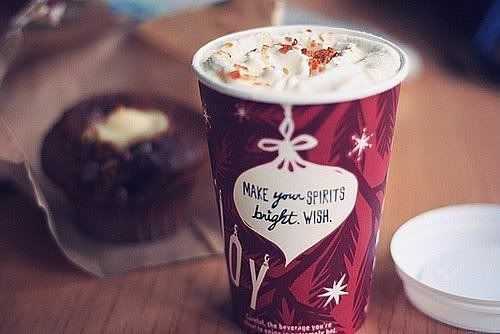 mmm holiday starbucks is just the best! love that new peacoat too! Love this whole outfit. The peacoat jacket is great. I'm leaving peacoats right now. They're so stylish and warm. And those suede shoes are so amazing. I love your sparkly tank! It's so festive - what a great way to work a little glitter into the daytime! Mmm is that a caramel brulee latte? I've been drinking so many of those to keep the holiday spirit alive. Love the navy peacoat and buffalo plaid bag. Love that coat...pulls the outfit together so nicely! hahah I think it's hilarious how excited you are for cold weather! You've got the cozy style down pat; love the color of that navy jacket! Garnier wants you to Rock Your Style this season - enter Part 3 of my Holiday Giveaway Bonanza to win a special Garnier hair care pack! Studs on your pockets?? I love it!! So cute girl! 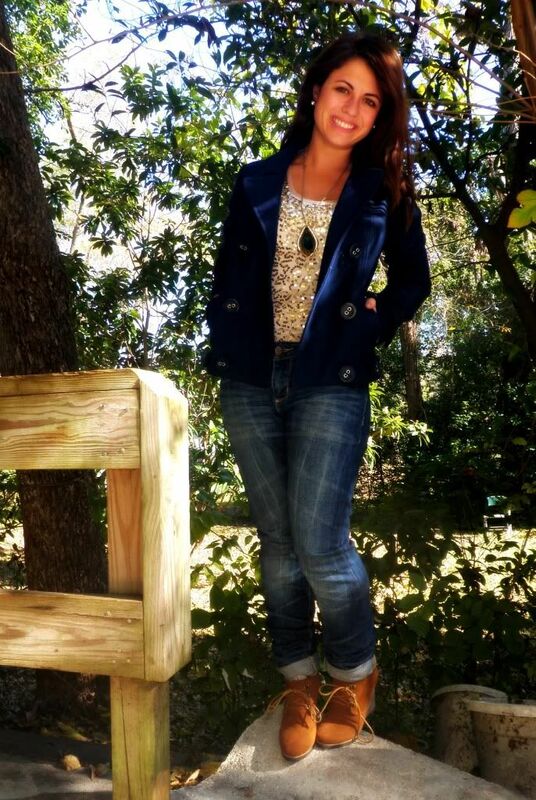 The peacoat looks beautiful on you, and love your sparkly top! 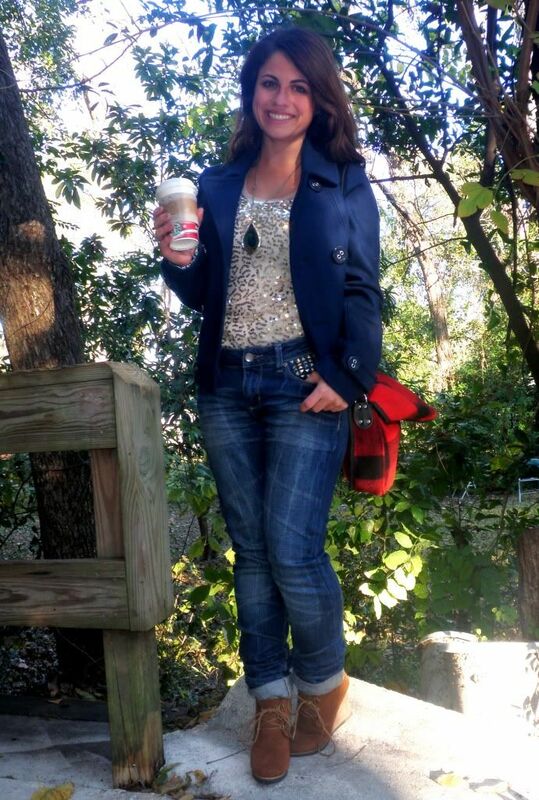 Love the peacoat & adore that sparkly top on you. Ohh you look so cute! I love that peacoat and those wedges. You're going to be looking good in Wisconsin haha. happy holidays :) your blog is amazing we have the same quote loves it!!! i love sequined shirts during the day, you look gorgeous!